Our company approach and philosophy can be summed up in a single word: respect. Respect for the wood we use. Respect for the homes we build. And, of course, respect for the people living in those homes. 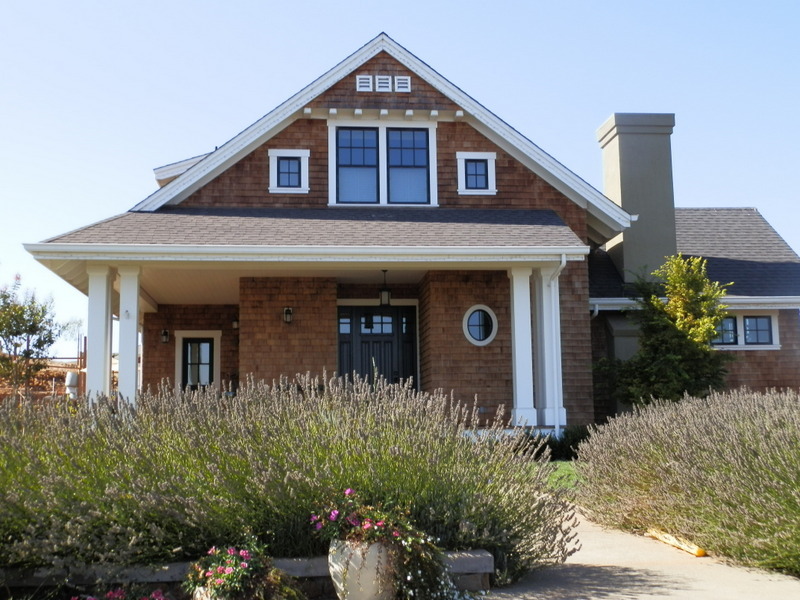 We use top grade red cedar shingles, forested from the Northwest, almost exclusively. In addition to being responsibly harvested, red cedar offers superior longevity, consistency in appearance and natural resistance to insects. 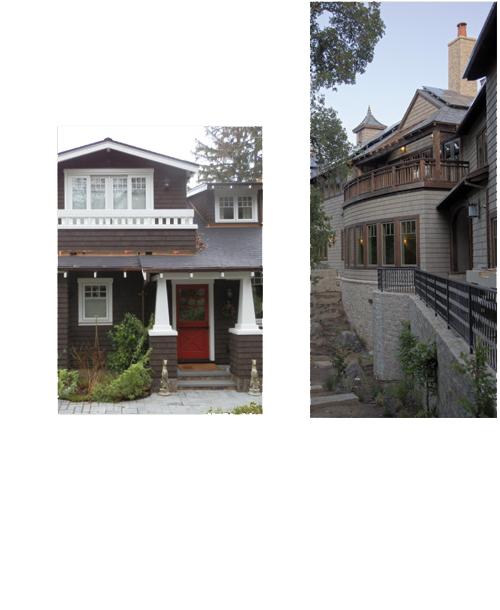 No matter if it is a simple bungalow or a highly-decorated Victorian. 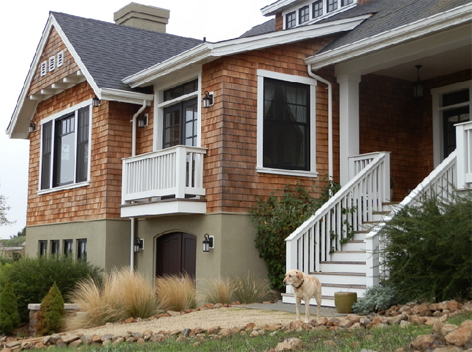 Every shingled home has its own character — and its particular challenges. Before we begin a job, we spend considerable time getting to know the home’s history, and understanding it’s requirements. Whether we’re doing a small repair, or sidewalling the entire home for the first time, we want to make sure our work will last the lifetime of the home. There’s no way to get around it: shingling a home involves making a lot of noise. We haven’t found a way to sound-proof our site, but we do everything else we can to minimize our intrusion. That means giving our clients a schedule, and sticking to it. Making sure our worksite straight and clean at the end of every day. And, keeping in close communication with our clients throughout the job, so that everyone walks away happy. We give plenty of time and attention to all three. Here are some things you should know before you hire a sidewall shingling contractor. Our first step is to meet for a complimentary consultation; get a scope of the work and the information we need to provide an accurate proposal. Expect us to be asking plenty of questions at that first visit. We’ll want to know what you know about the home’s history, and any issues or particular concerns you have. Every home is different. To make sure the shingling job we do for you lasts a lifetime, we’ll be considering everything that influences your home’s integrity. Weather exposure. Water drainage. Planting. The age of the home. And, of course, we’ll want to get a clear idea from you about how you’d like it to look. After 35 years of sidewall shingling, there are few firms who can match our longevity. And, because our current crew has been working together for almost a decade, we can guarantee our efficiency and effectiveness as well as our result. There are many more technical aspects to shingling than meet the eye. To get a deeper understanding of exactly what we do, read our article published in the Journal of Light Construction. 1. Roong and Sidewall Shingling are two different skills. Shingles are most commonly used on roofs. So, it’s natural to think that a roofer can also do sidewall shingling. Not so. 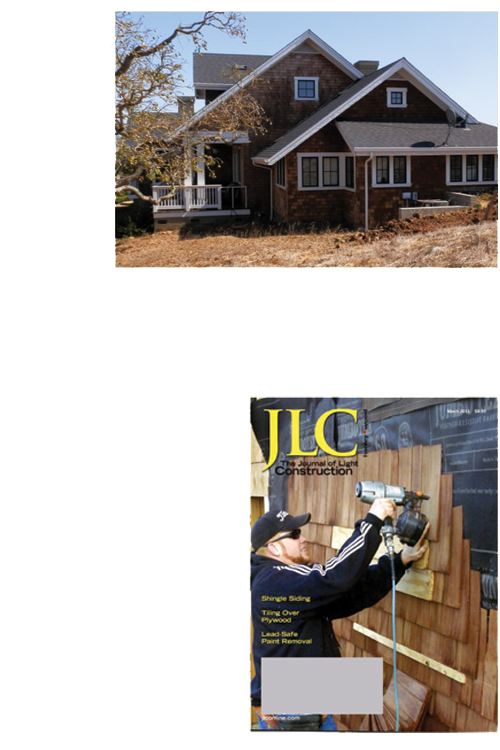 Roong and sidewall shingling are two different trades, and require very different skills. Roong is a skill. Sidewall shingling is a craft. Hire a roofer to do your roof. Hire a sidewall shingler to shingle the sides of your home. 2. 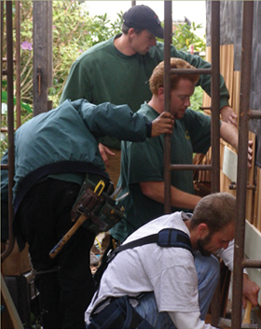 Find out if your contractor is licensed to do the work. 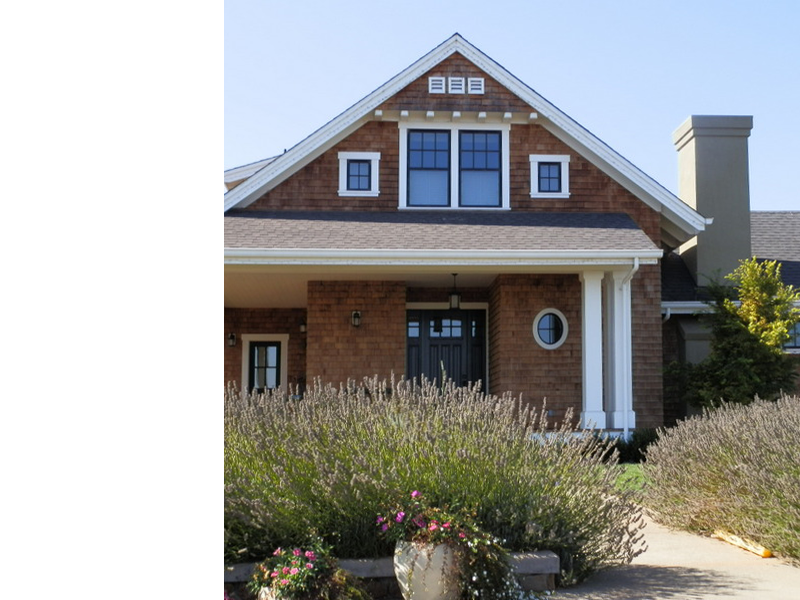 Installing sidewall shingles correctly is a more complex process than it may appear. 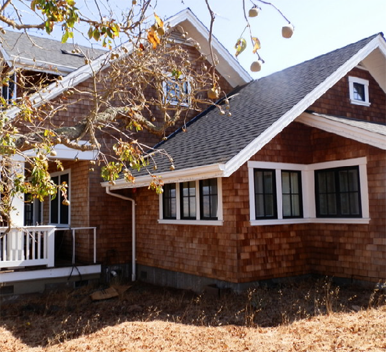 To make sure your job is done to code, the state of California mandates that only General Contractors, Framers, and those contractors holding the Sidewall Shingling license may legally install sidewall shingles. Make sure the people you hire are licensed to do the work. 3. The shingler should spend time getting to know you and your home. Estimating shingling isn’t just about the adding up the number of square feet. There are also patterns, finishes and trims to consider. Exposure. Trouble spots. Plus your concerns. An experienced shingler will want to find out all he can up front, both to give you an accurate estimate of time and cost, and to make sure you have a clear idea of what will be involved in completing your job. Your shingler will be working on your home for some time. Make sure you’re comfortable with your working relationship from the get-go. 4. Investing a little more now could save you a bundle later. There is no question: sidewall shingling a home is a significant expense. And getting the best price is everyone’s concern. But don’t cut corners on your shingling. Done correctly, sidewall shingles will protect a home for decades, looking beautiful even as they age. On the other hand, a bad shingling job can expose your home to weather and water damage, which may not be evident until real harm is done. Hiring a roofer to do a sidewall shingler’s job may save money initially; but the long term cost of repairs can far outweigh that advantage, and end up costing much more time, energy and money. 5. If your shingler doesn’t recommend Western red cedar, ask why not. The tight, straight grain of Western red cedar offers superior performance and durability, takes stains well, and offers a beautiful result. In addition, its natural oils offer natural resistance to insects. If your shingler suggests using another type of wood, make sure you ask for their reasons why — and understand the difference it will make in looks and longevity. 6. Know what kind of shingles you’re getting. When it comes to shingles, there is a clear and visible difference between “good,” “better” and “best.” For uniformity, you want to make sure your shingler is using premium grade shingles. 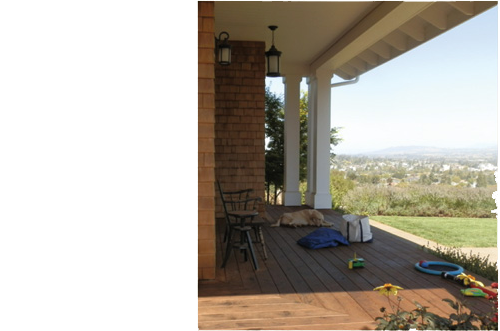 A lesser grade of wood may look better on your bottom line; but you won’t be happy with the way it looks on your home. 7. Know what to expect from your shingles’ performance. Extractives — tannins, oils, resins — are what give Western red cedar its beautiful aroma and its natural resistance to pests. Extractive bleeding can occur when the wood is exposed to water, leaving “tea stains” on the wood. This is a natural process, and one you should expect. If you’d rather your shingles not go through this natural weathering, ask your shingler about treating your shingles with a stain-blocking finish. 8. Sidewall shingling is a great green choice. Cedar shingles can be impregnated with re-retardant that allows them to resist burning even under extraordinary conditions. Every situation is different, but chances are good you can have the shingled home you want without exposing your home to increased fire risk. Finally, and most importantly, when it comes to shingling, experience matters. Shingling is like putting the pieces of a jigsaw puzzle together — and each one has to fit perfectly. Since each home is different, what works for one home may not work for another. It takes years of doing many different kinds of homes to reach the level of master shingler. Make sure the shinglers you choose are masters in their craft.